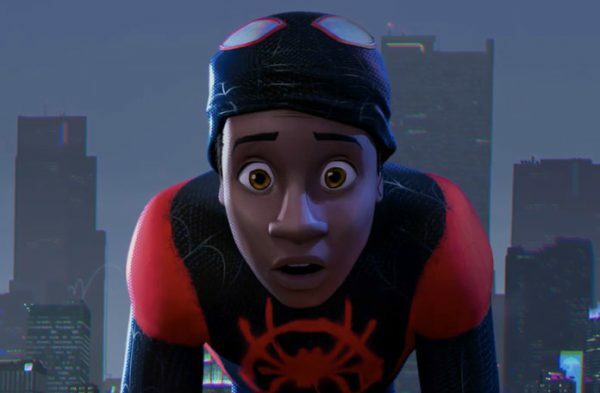 Animated superhero based on the Marvel Comics character Miles Morales, directed by Bob Persichetti, Peter Ramsey, and Rodney Rothman, produced by Phil Lord and Chris Miller. The story centers on Miles Morales (Shameik Moore) who juggles his high school life with his status as a superhero. Peter Parker: [voice over] Alright, let’s do this one last time. My name is Peter Parker. I was bitten by a radioactive spider. And for ten years, I’ve been the one and only Spider-Man. I’m pretty sure you know the rest. Uncle Ben: With great power comes great responsibility. Peter Parker: [voice over] I saved a bunch of people, fell in love, saved the city. And then I saved the city again. And again, and again, and again. And I did, uh, I did this. Peter Parker: [voice over] We don’t really talk about this. Look, I’m a comic book. I’m a cereal. I did a Christmas album. I have an excellent theme song. Peter Parker: [voice over] And a so-so popsicle. I mean, I’ve looked worse. But after everything, I still love being Spider-Man. I mean, who wouldn’t? So no matter how many hits I take, I always find a way to come back. Because the only thing standing between this city and oblivion is me. There’s only one Spider-Man. And you’re looking at him. News Reporter: There are multiple reports of another mysterious seismic event last night. Sources close to Spider-Man say he’s looking into the problem. Jefferson Davis: Spider-Man. I mean, this guy swings in once a day, zip, zap, zop in his little mask and answers to no one. Right? Miles Morales: Yeah, Dad. Yeah. Jefferson Davis: …lives on the line, no masks. Jefferson Davis: You know, we show our faces. Miles Morales: Oh, no! Dad, dad, speed up. Speed up. I know these kids. Jefferson Davis: With great ability comes great accountability. Miles Morales: That’s not even how the saying goes. Jefferson Davis: I do like his cereal, though. I’ll give him that. Jefferson Davis: I love you, Miles. Miles Morales: Yeah, I know, Dad. See you Friday. Jefferson Davis: [into the P.A] You got to say “I love you” back. Miles Morales: Dad, are you serious? Miles Morales: You want to hear me say it? Miles Morales: You’re dropping me off at school. Miles Morales: Look at this place. Miles Morales: Dad, I love you. Jefferson Davis: [into the P.A] That’s a copy. Jefferson Davis: [into the P.A] Tie your shoes, please. Doc Ock: Every choice that we make would create countless other possibilities. Miss Calleros: Mr. Morales. Moving in the dark. You’re late again. Miles Morales: Einstein said time was relative, right? Maybe I’m not late. Maybe you guys are early. Gwen Stacy: Sorry. It was just so quiet. Miss Calleros: Would you like to keep standing there, or do you want to sit down? Miles Morales: Can they hear my thoughts?! Why are all my thoughts so loud?! Brooklyn Visions Security Guard: I know you snuck out last night, Morales. Miles Morales: Not that dumb! Peter Parker: Are you mad at me? I feel like you’re mad at me. Brooklyn Bystander: Yeah, I think it’s a Banksy. Stan: I’m going to miss him. Stan: We were friends, you know. Miles Morales: Can I return it if it doesn’t fit? Stan: It always fits, eventually. Peter B. Parker: [voice over] Alright, people, let’s do this one last time. My name is Peter B. Parker. I was bitten by a radioactive spider. And for the last twenty-two years, I thought I was the one and only Spider-Man. I’m pretty sure you know the rest. You see, I saved the city, fell in love, I got married, saved the city some more, maybe too much. My marriage got testy, made some dicey money choices. Don’t invest in a spider-themed restaurant. Then like fifteen years passed. Blah, blah, blah. Super boring. I broke my back, a drone flew into my face, I buried Aunt May. My wife and I split up. But I handled it like a champion. Peter B. Parker: [voice over] Because, you know what, no matter how many times I get hit, I always get back up. And I got a lot of time to reflect and work on myself. Did you know that seahorses, that they mate for life? Could you imagine a seahorse seeing another seahorse, and then making it work? She wanted kids and, and it scared me. I’m pretty sure I broke her heart. Peter B. Parker: [voice over] Flash-forward, I’m in my apartment doing push-ups, doing ab crunches, getting strong, when this weird thing happened. And I got to say, weird things happen to me a lot. But this was real weird. Peter B. Parker: [voice over] You see, I was in New York, but things were different. Also, I was dead, and blond. I was kind of perfect. It was like looking in a mirror. I have a feeling that the thing that brought me here was the thing that got him killed. You want to know what happened next? Me, too. Miles Morales: Why do you look like Peter Parker? Peter B. Parker: Because I am Peter Parker. Miles Morales: Then why aren’t you dead? And why is your hair different? Why are you older? And why is your body a different shape? Peter B. Parker: I’m pretty sure you just called me fat. Peter B. Parker: Hey, listen. You don’t look so hot either, kid. Most superheroes don’t wear their own merch. Miles Morales: Are you a ghost? Miles Morales: Are you a zombie? Peter B. Parker: Stop it. Miles Morales: Am I a zombie? Peter B. Parker: You’re not even close. Miles Morales: Are you from another dimension? Like a parallel universe where things are like this universe but different? And you’re Spider-Man in that universe? But somehow traveled to this universe, but you don’t know how? Peter B. Parker: Wow. That was really just a guess? Miles Morales: Well, we learned about it in physics. Peter B. Parker: Quantum theory. Miles Morales: This is amazing! Miles Morales: Hey, are you okay? Peter B. Parker: No, I’m not. Miles Morales: What’s going on with your body? Peter B. Parker: I don’t think my atoms are real jazzed about being in the wrong dimension. Peter B. Parker: Look, I’m not looking for a side gig as a Spider-Man coach. I got a lot going on in my dimension, like a lot. Peter B. Parker: Don’t you dare finish that sentence. Don’t do it! I’m sick of it. Peter B. Parker: Oh, you have a goober. Give it. Miles Morales: Wait, no. Not so fast. He called it an override key. Peter B. Parker: There’s always a bypass key, a virus key, a who-cares key. I can never remember, so I always call it a goober. Give it. Miles Morales: I need it to destroy the collider. Peter B. Parker: I need it to go home! Miles Morales: If I don’t turn off the collider after you leave, everyone in this city, my parents, my uncle, and millions of others, will die. And you’re just going to go home and leave me here to figure this out for myself? You good with that, Spider-Man? Peter B. Parker: What are you doing? Miles Morales: Making you feel guilty. Is it working? Peter B. Parker: No! No! No! Do not let him win! Peter B. Parker: Alright, kid. You win. Come on, we don’t have a second to lose. Peter B. Parker: Mmm. I love this burger, it’s so delicious. One of the best burgers I’ve ever had. In my universe, this place closed six years ago. I don’t know why. I really don’t. Mmm. Peter B. Parker: You have money, right? I’m not very liquid right now. Miles Morales: Can we focus? Peter B. Parker: Mm-hmm. Sure. Peter B. Parker: You going to eat that? Peter B. Parker: I’m listening. Miles Morales: The other Peter said he was going to be showing me the ropes. Miles Morales: You got any Spider-Man tips you can tell me now? Peter B. Parker: Yeah, I got plenty. Disinfect the mask. You’re going to want to use baby powder in the suit, heavy on the joints. You don’t want any chafing, right? Peter B. Parker: Nope, that was everything. Miles Morales: I think you’re going to be a bad teacher. Peter B. Parker: And it’s a no on the cape. Miles Morales: I think it’s cool. Peter B. Parker: Take that off. It’s disrespectful. Peter B. Parker: Spider-Man doesn’t wear a cape. Peter B. Parker: Teenagers, just the worst. Miles, where did you go? Miles Morales: I’m right here. Peter B. Parker: Where? I can’t see you. Miles Morales: I’m right in front of you. Can Spider-Man turn invisible? Peter B. Parker: Not in my universe. Miles Morales: Aah! You just poked me in my eye! Peter B. Parker: This is incredible. Some kind of fight or flight thing. Doc Ock: And obviously you’ve been glitching. Peter B. Parker: Glitching? No. Why would you even say that? Doc Ock: If you stay in this dimension too long, your body’s going to disintegrate. Do you know how painful that would be, Peter Parker? Peter B. Parker: I don’t know. Doc Ock: You can’t imagine. And I, for one, can’t wait to watch. Peter B. Parker: What did you say your name was? Doc Ock: Dr. Olivia Octavius. Peter B. Parker: Can I assume that your friends call you Doc Ock? Doc Ock: My friends actually call me Liv. My enemies call me Doc Ock. Peter B. Parker: This would be a good time to turn invisible. Peter B. Parker: Okay, not going to turn invisible. Selecting a bagel. Act super normal. Peter B. Parker: You know, that’s funny, I get that a lot. Peter B. Parker: [to Miles] Now we do a switchy-switchy. Woman: Get back here! Where do you think you’re going? He took a bagel! Peter B. Parker: Alright, time to swing, just like I taught you. Miles Morales: When did you teach me that? Peter B. Parker: I didn’t. It’s a little joke for team building. Peter B. Parker: Alright, are you ready? Miles Morales: Of course I’m not ready! Miles Morales: I can’t do this yet! Peter B. Parker: Everybody knows that the best way to learn is under intense life threatening crisis. Peter B. Parker: What are you doing down there? Miles Morales: I run better than I swing. Peter B. Parker: You got to swing or they’ll catch you. This is what you wanted. Peter B. Parker: Aim with your hips! Look where you want it to hit. Square your shoulders. Don’t forget to follow through! Don’t shoot off your back foot. Miles Morales: That’s too many things! Peter B. Parker: Then stop listening to me! Miles Morales: That’s the best idea you’ve had all day! Peter B. Parker: Nice, Miles! Miles Morales: I’m doing it! Peter B. Parker: Good. You’re doing it. Double tap to release and thwip it out again. Peter B. Parker: Thwip and release. Miles and Peter: And thwip. Release. Thwip. Peter B. Parker: And release. You’re a natural. Miles and Peter: Thwip. Release. Peter B. Parker: Feel the rhythm? Miles and Peter: Thwip. And release! Peter B. Parker: Good, Miles. Miles Morales: I got to say, you’re amazing, man. Peter B. Parker: We’re a little team! Me as the teacher, who could still do it. You as the student, who can do it, just not as good. I’m proud of us. Is there something you want to say to me? Gwen Stacy: It’s Gwen, actually. Peter B. Parker: Oh, you know her. Very cool. Gwen Stacy: I’m from another dimension. I mean, another, another dimension. Gwen Stacy: [voice over] Alright, people. Let’s start at the beginning one last time. My name is Gwen Stacy. I was bitten by a radioactive spider. And for the last two years, I’ve been the one and only Spider-Woman. You guys know the rest. I joined a band. Saved my dad. I couldn’t save my best friend, Peter Parker, so now I save everyone else. And I don’t do friends anymore, just to avoid any distractions. And one day this weird thing happened. And I mean like really weird. I was blown into last week. Literally. I landed in New York, but not my New York. My Spider-sense told me to head to Visions Academy. I wasn’t sure why, until I met you. Miles Morales: I like your haircut. Gwen Stacy: You don’t get to like my haircut. Let’s go. Miles Morales: How many more Spider-People are there? Peter B. Parker: Save it for Comic-Con. Peter B. Parker: Oh, yeah, I got one of these, too. A little, old shed where I keep my Spider gear. Peter B. Parker: I mean, this place is pretentious. Miles Morales: Woh. Dude. Was yours anything like this? Peter B. Parker: Mine was like this, but take away the jeep, the plane. Imagine it way smaller. Imagine a futon. I feel sad for this guy. Miles Morales: Kingpin knows we’re coming. We’re going to be outnumbered. Aunt May: Don’t be so sure. You might need these. Do you think you’re the only people who thought to come here. Miles Morales: Is he in black and white? Peter B. Parker: Where is that wind coming from? We’re in a basement. Spider-Man Noir: Wherever I go, the wind follows. And the wind smells like rain. Peni Parker: Hi, guys. Konnichiwa. Peter B. Parker: This could literally not get any weirder. Spider-Ham: It can get weirder. Spider-Ham: I just washed my hand, that’s why they’re wet. No other reason. Spider-Man Noir: My name is Peter Parker. Peni Parker: My name is Peni Parker. Spider-Ham: My name is Peter Porker. Spider-Man Noir/Peni Parker: I was bitten by a radioactive spider. Spider-Ham: I was bitten by a radioactive pig. Spider-Man Noir: In my universe, it’s 1933, and I’m a private eye. I like to drink egg creams, and I like to fight Nazis, a lot. Peni Parker: I’m from New York in the year 3145. I have a psychic link with a spider who lives inside my father’s robot. And we’re best friends, forever. Spider-Man Noir: Sometimes I let matches burn down to my fingertips just to feel something, anything. Peter B. Parker: Okay! Enough! Spider-Man Noir: Who are you again? Peter B. Parker: This is Miles. And he’s going to save the multiverse. Peter B. Parker: This kid can turn himself invisible. Watch this. He can do it, now. Miles Morales: I can’t do it on command. Peter B. Parker: He can’t do it on command. But it is cool. Show them the zappy thing, Miles. Miles Morales: Can’t do it on command. Peter B. Parker: He can’t do it on command. But he can do so much more. Like what else do you do? Miles Morales: Just those two things. Peter B. Parker: Just those two things. Gwen Stacy: Look, I’ve seen him in action. He’s got potential. I think he’s going to get us home. Spider-Man Noir: Okay, little fella, Kingping’s going to send a lot of mugs after ya. And I’m talking hard boys, real biscuit boxers. Can you fight them all off at once? Miles Morales: Well, uh, I haven’t actually fought anyone. Peni Parker: Can you rewire a mainframe while being shot at? Miles Morales: Can I what? Gwen Stacy: Can you swing and flip with the grace of a trained dancer? Spider-Man Noir: Can you close off your feelings so you don’t get crippled by the moral ambiguity of your violent actions? Aunt May: Can you help your aunt create an online dating profile so she can get out of the dang house once in a while? Spider-Ham: Can you float through the air when you smell a delicious pie? Gwen Stacy: Can you be strong? Miles Morales: I don’t know. Maybe. Spider-Man Noir: Show me some moxie, soldier! Gwen Stacy: Above all, no matter how many times you get hit, can you get back up? Spider-Man Noir: Spider-Man always gets up. Gwen Stacy: Come on, Miles. Peni Parker: Come on, Miles. You can do it. Gwen Stacy: You can do this. Peter B. Parker: Guys, cool it. Peni Parker: Come on, Miles. You can do it! Spider-Man Noir: Get up, Miles. Gwen Stacy: Come on, Miles. Get up. Gwen Stacy: [to Peter] You need to be more honest with yourself about this. He’s not ready. It’s obvious. Spider-Man Noir: There’s no way. He’s just a kid. Gwen Stacy: If he can’t do this, we have to stay and do it for him. Spider-Man Noir: He’s looking right at us while we talk about him. Peter B. Parker: Miles? Miles? Peter B. Parker: You see that? He can, um, he can turn invisible. Spider-Man Noir: This is purple. Miles Morales: Uncle Aaron. This is my fault. Uncle Aaron: No, Miles. I’m sorry. I wanted you to look up to me. I let you down, man. I let you down. You’re the best of all of us, Miles. You’re on your way. Just keep going. Just keep going. Peter B. Parker: We’ve all been there. You know, for me, it was my Uncle Ben. Spider-Man Noir: For me, it was my Uncle Benjamin. Peni Parker: For me, it was my father. Gwen Stacy: For me, it was my best friend. Spider-Ham: Miles, the hardest thing about this job is, you can’t always save everybody. Miles Morales: Look, it was my fault. You wouldn’t understand. Gwen Stacy: Miles, we’re probably the only ones who do understand. Spider-Ham: Do animals talk in this dimension? Because I don’t want to freak him out. Peter B. Parker: Look, I know how much you want this, kid. Spider-Man Noir: Poor little guy. Peter B. Parker: But you don’t have it yet. I’m sorry. Miles Morales: When will I know I’m ready? Peter B. Parker: You won’t. It’s a leap of faith. That’s all it is, Miles. A leap of faith. Jefferson Davis: Look, sometimes people drift apart, Miles. And I don’t want that to happen to us, okay? Look, I know I don’t always do what you need me to do, or say what you need me to say, but I see this spark in you. It’s amazing. It’s why I push you. But it’s yours, and whatever you choose to do with it, you’ll be great. Look, call me when you can. Okay? I love you. You don’t have to say it back, though. Gwen Stacy: What a pig. Spider-Ham: [insulted] I’m right here. Peter B. Parker: Oh, wow. Mary Jane: Um, I just wondered if we could have some more bread at table twelve? Peter B. Parker: Yeah. I’m just, uh, I’m really sorry. Mary Jane: Oh. Don’t be sorry. It’s just bread. Peter B. Parker: No, I wasn’t there for you when you needed me. Peter B. Parker: I didn’t even try. Mary Jane: That’s fine. You know, I should really get going. Peter B. Parker: I know I could do better, if I just had another chance to give you a, the bread that you deserve. Mary Jane: Are you okay? Gwen Stacy: Ma’am, we’ll take care of that bread right now. Mary Jane: [to Peter] It’s been nice, uh, talking to you. Gwen Stacy: For you, they should fill this place up with fresh bread. Gwen Stacy: Are you alright, man? Peter B. Parker: Oh, yeah. Totally. Gwen Stacy: Good, because we are not getting any bread. Scorpion: What are you, some kind of silly cartoon? Spider-Ham: You got a problem with cartoons? Spider-Ham: Did that feel like a cartoon? Peter B. Parker: Is he allowed to say that, legally? Miles Morales: I look forward to working with you. Jefferson Davis: Yeah. Yeah, me too, I guess. I don’t approve of your methods, but we’re just going to have to agree to disagree. Miles Morales: Thank you for your bravery tonight. I love you. Miles Morales: And look behind you! Miles Morales: [voice over] Okay, let’s do this one last time, yeah? For real this time. This is it. My name is Miles Morales. I was bitten by a radioactive spider, and for like two days, I’ve been the one and only Spider-Man. I think you know the rest. I finished my essay. Saved a bunch of people. Got hit by a drone. I did this with my dad. Met my roommate. Finally. Slapped a sticker where my dad’s never going to find it. And when I feel alone, like no one understands what I’m going through, I remember my friends who get it. I never thought I’d be able to do any of this stuff, but I can. Anyone can wear the mask. You could wear the mask. If you didn’t know that before, I hope you do now. Because I’m Spider-Man. And I’m not the only one. Not by a long shot. Gwen Stacy: Miles. Miles! You got a minute? Lyla: You’re a bit late. Miguel O’Hara: We can’t all be everywhere at once. Lyla: Little text might’ve been nice. Miguel O’Hara: I was gone for less than two hours. What happened? Lyla: Okay, okay, okay. I know what it looks like. But here’s the good news. Miguel O’Hara: Oh, here we go. Lyla: The multiverse didn’t collapse. Lyla: A little touch and go. But it worked out. Miguel O’Hara: Great story. Hey, did you finish the goober? Lyla: It’s not a goober. It’s a gizmo. Miguel O’Hara: Do you always have to call me out? It’s just really frustrating and it bums me out. Lyla: Don’t get excited, Miguel. It’s just a prototype. Lyla: But you could be the first person to make an autonomous multiverse jump. Or the last. Miguel O’Hara: Okay, so we’re just going to roll the dice on this? Lyla: So, what you do you say, pal? Where you want to go first? Miguel O’Hara: Let’s start at the beginning one last time. Earth ’67. Spider-Man ’67: Woh. What the…? Miguel O’Hara: I’m Spider-Man. I need you to come with me. Spider-Man ’67: Who the heck are you? Miguel O’Hara: I just told you… Listen. Listen, I’m from the future. Spider-Man ’67: How dare you point at me. Miguel O’Hara: You were pointing first. Spider-Man ’67: It’s rude to point. Miguel O’Hara: You’re being very rude. You’re not even believing what I’m saying! Police Officer: Which one pointed first? J. Jonah Jameson: Spider-Man pointed first. Obviously! Miguel O’Hara: You’re pointing at me right now! Miguel O’Hara: Look at you! Look at your finger! Look at your finger right now! What’s it doing? Spider-Man ’67: … which is different that normal pointing. You haven’t seen pointing until I’m finished with you. Miguel O’Hara: You are pointing. You’re accusing me of pointing while you’re…! What do you think of Spider-Man: Into the Spider-Verse quotes? Let us know what you think in the comments below as we’d love to know. If you ever wanted a fun movie Spider-verse is an easy pick. You all should see this movie! One nitpick though the fps is weird at the begging but your eyes adjust later so not a big deal. Miles is straight taken from a comic and same as any other Spider-Person! It has a good message and from more sides! SPOILERS! Peter learns that he maybe (after teaching miles to be Spider-Man) may be ready for kids and Miles learns to be Spider-Man and control his strength and ability’s! I am going from a perspective of is it fun and good? Yes it is! I usually have a hard time telling anyone to watch superheroes cos they’re not for everyone. But this one… ANYONE CAN SEE THIS! Kids, Teens, Adults, or Elders, anyone! So if you have to pick a movie to see it’s Spider-Verse! Seeing it 2 or 3 times made it better in my option.